We produce for Italy and abroad silicone ice cream molds gastonomy. 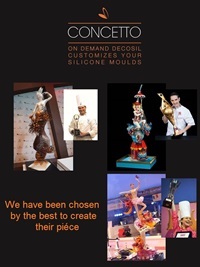 Italian leaders of silicone moulds, we create and sell for over 10 years silicone ice cream molds gastonomy, food safe silicone moulds worldwide to confectioners, bakeries and Delicatessens. The new innovative and trendy decosil's proposal is to apply the art of decoration in the world of ice cream to enhance the aesthetic appearance of an Italian product sold worldwide. With the molds, the creations are realized in a simple and fast, and they are displayed in the window case ready to be sold to customers who care originality and looking to experience the pleasure of aesthetic taste. The right approach to stand out and increase customer satisfaction.